[New for 2018] It's been a tough week and a long day, so let's do a quick post. 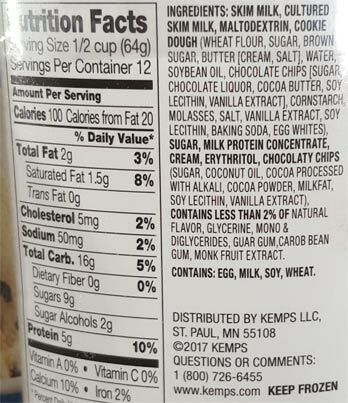 Kemps, the midwest folks who seem to put out a new froyo every six months, have merged their froyo love with the current annoying trend of replacement sugar in products to bring down the calorie count. Sorry, you know the sugar replacement trend bugs me more than it should. JoyFULL Scoops sounds like Lovin Scoopful and Sweet Scoops decided to team up. Yup, Erythritol and Monk Fruit Extract. No thanks. Nevermind. Look, if you prefer these two over splenda or calories, that's fine by me, that's why I'm pointing these out incase they grab your attention. The poor Yo2 lineup didn't last very long (reviews here and here) so we'll see if this line has better luck. If you wind up trying these, please leave your thoughts in the comments. Good night! More new stuff tomorrow! 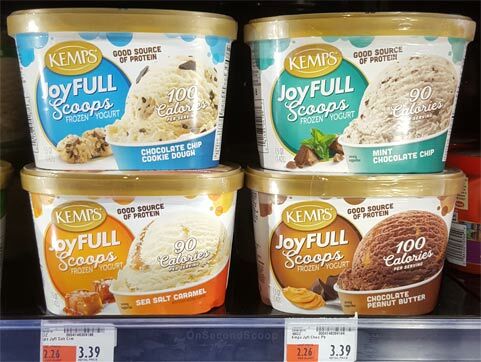 I love Kemps Frozen Yogurt, but this time our local store, which can be a bit unpredicable in its stocking habits (Hanafords Supermarkets) had the JoyFULL scoops products. I bought the Chocolate Chip Cookie Dough and Carmel Sea Salt. My Wife, who gets skin irritation from most sweetners, turned up her nose at the sweetners immediately. The sweetners weren't awful, although there is a slight aftertaste, but the texture was awful. Like ice milk. Not creamy at all like regular Kemps. I'll pass in the future. My wife loves ice cream and needs low calorie. Found joyful scoops. They freeze harder, but 20 seconds in microwave and it scoops out fine. We love the taste, and find it plenty creamy. Please keep this one in stores!! Bought the Chip Cookie dough. Might have been enough cookie dough in the entire tub to to make one cookie. Will not be purchasing again.